When one person wants sunlight and another wants shade, CableShade retractable awnings provide the perfect solution. These canopies are manually controlled to allow you to retract any one of the canopies to any increment you desire. The canopy design is suitable to most any deck or patio size, as well as most any pergola configuration. 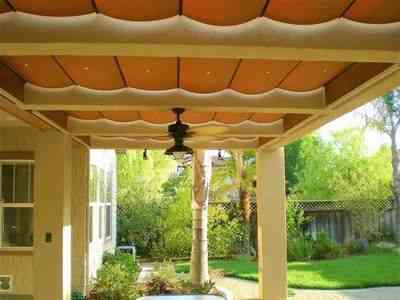 On an existing pergola, our versatile CableShade retractable canopies are simply added to the underside of the arbors, not between the arbors. If building the pergola or frame in conjunction with adding the canopies, then yes, our canopies can be designed to fit between the arbors. 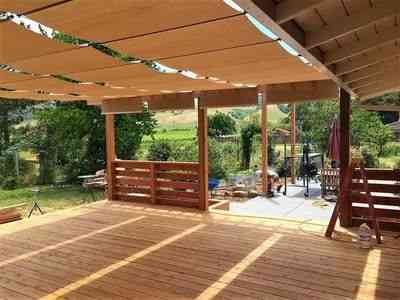 If you do not have a pergola, we can help you with that as well. CableShades can extend up to 20 feet and more with a cross-support. They work whether on the level or if on a slope. Since they are made from stainless cables and eyelets where the cables glide, you can rest easy knowing your new awning will last many years (10 to 20 years expectation -- depending on care and conditions). Color/ Design - CableShade Retractable Patio Covers are available in hundreds of colors and patterns, including stripe patterns in up to 60-inch widths, which are not available from many competitors. Check out our photo gallery as well as visit us on Instagram @cableshade2404 for more details. Fabric Durability - It is advised not to order any system where the cables or wires are threaded over the fabric. Though the cable is strung a few inches above the material, the wind can still whip it up against the cable or wire, quickly wearing out the material. The CableShade design runs the cables beside the fabric, not over, and uses only the highest grade, waterproof outdoor fabrics. Design Durability - The minimal space between each pergola canopy allows for proper rain drainage and wind-pressure release, where other fabric canopies or shade sails can be torn down or ripped with strong winds or heavy rains. CableShade canopies also do not use expensive motors or cranks, which can be damaged and have costly repairs. Our awnings retract easily with provided skyhook in seconds. System Component Durability - CableShade uses stainless steel components, where other systems may use parts that can rust or easily break over time, causing costly repairs. Versatility - Extend your retractable canopies in warmer weather to stay out of the sun, or retract back in the cooler seasons to enjoy the sunshine! In areas with snow, our canopies easily withdraw back to be wrapped and winterized to protect from snow and ice.